Rocks and Regolith are the major lunar resources that can be exploited by future astronauts to achieve some degree of self-reliance and ensure its long-term survival. The chemical composition of these resources allows for the extraction of oxygen (O2) for life support, and of silicon (Si) and metals for solar-cell fabrication and parts manufacturing. The Basalt, a mafic extrusive rock, is the most widespread of all igneous rocks, and comprises more than 90% of all volcanic rocks –it is commonly found on the Moon and Mars. The Regolith is the layer or mantle of fragmental, incoherent, unconsolidated rocky material that overlies the bedrock. This layer is considered to be 4- to 5-m thick in the mare regions but may average about 10 to 15 m in older highland regions. The Regolith layer overlies the material referred to as Megaregolith. The lunar regolith is a mixture of rock, mineral, and glass fragments transformed into a distinctive material by a unique combination of space weathering processes. Mainly formed by the in situ degradation of underlaying rocks, due at incessant meteroite bombardements at the surface, the powered Regolith consist of particles of less than 1 cm. The lunar regolith is composed of Crystalline rock fragments, mineral fragments, breccias, agglutinates, and glasses. Today, impact processes on the Moon have reached a steady state with regard to the soil thickness, grain-size distribution, and other properties. Grain-size distribution controls the dominant physical nature if the regolith, such as the strength, as well as optical, thermal and seismic properties. Moon's rocks were formed by melting of the solid interior, probably at depths of 100-400 km, followed by the buoyant rise of molten rock (magma) to the lunar surface and its eruption. Two types of volcanic rocks have been erupted that are lava flows and pyroclastic deposits. These types are the most dominant in the basaltic volcanic rocks. The lunar lava flows has probably erupted from fissures at the surface. It is suggested that, because lunar basalts contain more iron (Fe) and, less silicon (si) and aluminium (Al) than terrestrial basalts. Thus, the lavas were surely quite fluids and formed thin, widespread flows. The basalt is a dark, fine-grained, extrusive igneous rock with a low silica content of 40-50%, but rich in iron, magnesium and calcium. Generally, it occurs in lava flows, but also as igneous intrusions known as dikes. It is suggested that, the lunar basalts containing > 9% of TiO2 (titanium oxide) are classified as High-Titanium (Ti) mare basalts and, if it have between 1.5 to 9% of Ti02, they are classified as low-Ti. Finally, it is considered very low when the rock contain < 1.5 Wt% of Ti02. 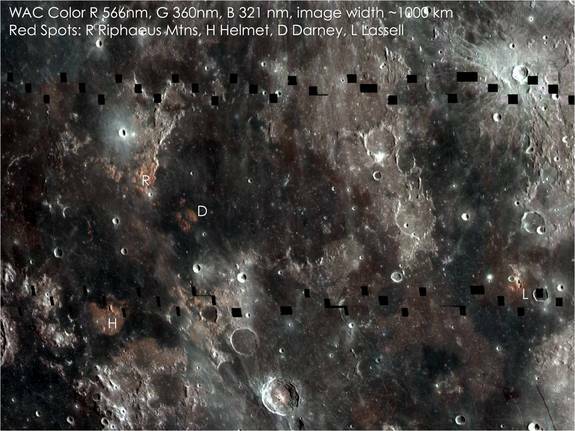 The range of compositions among lunar basalts is great, and allows for recognition of a wide variety of lunar mare basalt types. Mare basalts contain the minerals pyroxene, plagioclase, olivine, and ilmenite in proportions that reflect this variation in bulk chemistry. High-Ti basalts contain large modal proportions of ilmenite, and olivine basalts contain significant olivine in the mode. * Pyroxene: A group of silicate minerals having the general formula ABSi2O6 where A= Ca, Na, Mg, or Fe2+ and B= Mg, Fe2+, Fe3+, Cr, Mn, or Al, with Si partly replaced by Al. * Olivine: A silicate mineral that displays a solid solution series between Mg2SiO4 (Forsterite) andFe2SiO4 (Fayalite). * Ilmenite reduction: A method of extracting oxygen from the mineral ilmenite (FeTiO3). A reducing agent such as H2, C, etc. is reacted with the mineral to form H2O or CO, etc., which can then be separated (by electrolysis, for example) into O2 and reductant, after which the reductant is recycled to be used in the process again. One of the most fundamental features of the Moon is its division into two chemically distinct terrains: the mare basalts and the more abundant highland regions. Mare basalts contain greater concentrations of FeO and TiO2 and have higher CaO/Al203 ratios than do rocks from the highland areas, a situation that reflects the lower proportion of Al-rich plagioclase feldspar in the basalts. Fragments of older mare basalts, which have been found in rocks from the highlands, demonstrate that mare-type volcanism actually began before the final flooding of the visible maria. One of the most striking chemical characteristics of mare basalts is their large variation in TiO2 contents. Even within these groups, the compositions of highTi basalts vary significantly from sample to sample. Explanations for these differences are complicated by the fact that virtually all mare basalt samples were collected as loose blocks in the regolith, and no identifiable lava flows were sampled directly on the lunar surface. Titanium is an extremely tough material, but it’s when combined into alloys with other materials like iron or aluminum that it truly shines. It’s applications range from military, to medical, to telecommunications to the ever important aerospace industry. This mare regolith polarized of 1.6-mm long is a sample that come from the Apollo 17 site. Most of this soil is derived from High-Ti mare basalts, and includes light purple-brown pyroxenes, colorless plagioclase, basalt rock fragments, orange glass spheres (fire fountain droplets), and Fe-Ti oxides (black grain below center). Many of the dark fragments are de-vitrified impact glass and agglutinates. This High-Ti Basalt polarized of 8-mm long is a sample come from the Taurus-Littrow Apollo 17 site. The Sample is a vesicular, medium-grained basalt, and contains abundant pyroxene, plagioclase, and Fe-Ti oxides. This latter includes ilmenite, ulvospinel, and armalco-lite, with minor olivine trace. The Ilmenite is abundant in this sample, and is responsible for the elevated Ti content. This was the last sample collected by the Apollo 17 astronauts and the final Apollo sample collected on the Moon. This is an High-Ti Basalt polarized sample of 8-mm long. The pyroxenes are zoned with augite cores that transition to pigeon-ite and Fe-rich rims. Plagioclase surrounds euhedral (faceted) pyroxene in a texture called poikilitic. Based on analysis of melt inclusions, this sample exhibits evidence of silicate liquid intrusion. Credits: Images and descriptions of thin section photomicrographs by K. Hollacher, Department of Geology, Union College. Other images from Lunar Sample Compendium by C. Meyer, NASA JSC. Sampled from the Shorty crater during the Apollo mission 17 at the Taurus-Littrow site, the orange soil is nearly pure orange glass at 83%. The average grain size is ≈40 μm. The adjacent black glass beads differ only because it had been rendered opaque by de-vitrification. The orange soil is enrich in volatile elements, such as zinc, lead, silicon and, chlorine, and the glass beads have a thin coating of condensed volatiles. None of the glass in this sample is similar to lunar agglutinates, nor contains broken mineral or lithic fragments characteristic of impact glass. As such, it is distinct from other lunar soils and is described as a pyroclastic deposit. The plane polarized orange glass sample of 4-mm long is predominantly composed of orange partially de-vitrified (in black) glass spheres, and a small admixture of mare basalt fragments. The particle size is about 20 to 45 μm. Erupted basaltic melts were fragmented at the vent and followed ballistic trajectories. Those that quenched to glass without nucleating crystals are of clear orange color, caused by High-Ti content. The black ones contain olivine crystals that grew inward from the surface in blade shapes. The crystallization of many tiny ilmenite crystals on the olivine blade margins generates the black color . During the Apollo 15 mission, a green glass sample has been collected in the form of friable clods several centimeters in diameter from around Spur Crater on the Apennine Front. Although most lunar surface glasses are formed by meteorite impacts, these green glass beads are thought to come from the spraying of low-fluidity lava in a vacuum by fire fountains. Ranging from 40 to 250 μm in this image, these beads are sometimes found in presence of red and yellow-brown glasses. Reflecting multiple variations in composition, green glass is rich in Magnesium (Mg) (≈18% MgO) and volatile elements, and is often coated with zinc (ZnS). When the magmas reach the surface of the planet, the gases contained within can be explosively released. And, as lava pour from a fissure vent, these gases may be released to drive a fountain of molten droplets. On the Moon, these lava fountains associated with eruptions of basalt formed small glassy beads. Deposits of these beads are widely dispersed around lunar volcanic vents because of low gravity and eruption into a vacuum. Such pyroclastic deposits are similar to the volcanic ash deposited around lava fountains on Earth. Two striking examples of lunar pyroclastic rocks are the orange soils (although they really are not soils, but rather volcanic deposits) from the Apollo 17 landing site and the green glass from the Apollo 15 landing site. Orbital photographs of the lunar surface reveal dark-mantle deposits, which may also be of pyroclastic origin, surrounding apparent volcanic vents. Glassy material is present as droplets and fragments in lunar rocks. Lunar pyroclastic rocks are thought to have been formed by fire fountain activity which formed glassy material. Impact processes have also contributed to the development of glass in lunar soils. Apollo 11 green glass and Apollo 17 orange glass have compositional ranges that exceed those of lunar soils and may represent materials that could be exploited like ore deposits on Earth; e.g., some glasses are higher in magnesium (Mg) and Ti. * Glass Fraction. Meteorite impact processes are responsible for most weathering processes on the Moon. These impact events have produced impact-melt glasses in both mare and highland materials. Glasses such as the orange and green glasses have been produced by fire fountain eruptions. *High-magnesium anorthosite: The mafic minerals in the high-Mg anorthosite are relatively enriched in Mg compared to ferroan anorthosites. This glassy material is attractive as a resource as it would require less energy to remelt compared to a lithic fragment that would melt incrementally as each phase intersects the liquidus temperature. These data have confirmed the presence of mare basaltic and highland anorthositic rock types and have additionally provided chemical data for the distribution of Mg, aluminum (Al), calcium (Ca), Ti, and Fe. The lunar highland anorthosites are thought to have formed by flotation in the lunar magma ocean and for this reason are mineralogically concentrated in plagioclase and also are chemically more simplified than the mare basalts. The few samples that represent unmodified original highland material are termed pristine. The highland material has been subjected to significant meteorite bombardment and as a result has diverse textural relationships depending on the degree of melting and recombination with other mineralogical components. The terms monomict and polymict refer to the varying degree of incorporation of these other components in a rock. The lunar highlands are comprised predominantly of anorthosite, which is a rock made up of the mineral plagioclase feldspar. Lunar anorthosites contain the plagioclase mineral anorthite, which is the Ca- and Al-rich plagioclase end-member. Three major rock types have been identified in the lunar highlands sample inventory. * Highlands: The light-colored, older, more cratered lunar terrain at higher elevation, which is relatively enriched in calcium and aluminum. These regions are characterized by a higher albedo than the Mare regions of lower elevations. They comprise 80 percent of the lunar surface. The highlands are thought to be composed predominately of anorthosite. * Anorthosite: A plutonic rock composed almost entirely of plagioclase feldspar. Plagioclase in terrestrial anorthosite ranges from sodic andesine to calcic bytownite. However, the lunar anorthosite is nearly calcic plagioclase anorthite (CaAl2Si2O8) with compositions close to An95. *Plagioclase: A feldspar mineral which displays a solid solution series between NaAlSi3O8 (albite, abbreviated Ab) and CaAl2Si2O8 (anorthite, abbreviated An). Compared to terrestrial plagioclases, the lunar plagioclases are more calcic and less diverse. Plagioclase found in mare regions ranges from 74 to 98 mole percent An compared to Ab. Highland plagioclases are more calcic, ranging from percent An 90 to 99. Most of the white material observed in lunar rocks is plagioclase. * Highland Regolith 68501 Field-of-view: 2-cm long dimensionSample 68501 is a mature lunar highland soil from the Apollo 16 site that illustrates some of the rock types from the heavily cratered highlands. They include feldspathic crystalline rocks of anorthositic or noritic compo-sition, but many of the particles are microbreccias. Most of the dark, porous fragments are agglutinates. The clear fragments are plagioclase. Breccias containing fragments of feldspar are also present. Among the wide variety of rock types collected from the lunar highlands are at least a few that probably represent material from the original lunar crust that formed between 4.6 and 4.3 b.y. ago. The chemical compositions of these rocks indicate that, during this interval, extensive melting occurred in the outermost part of the Moon. According to several models, the Moon was covered by a “magma ocean”: a layer of molten silicate perhaps hundreds of kilometers deep. The question of a lunar magma ocean is fundamental to lunar history. If such an ocean cooled and crystallized, the physical separation of crystals (the floating of lower-density plagioclase feldspar) produced the original lunar crust. After crustal formation, the long history of intense meteoroid bombardment has masked most of the actual unaltered (pristine) lunar crust. Samples of nonbasaltic (e.g., highland) pristine rocks are rare. The few such samples that are believed to be pristine have been subjected to extensive study because of the clues they provide to understanding the origin and early history of the Moon. This work has been enlivened by the difficulty in distinguishing between genuine pristine highland rocks and similar rocks produced in large meteoroid impacts. First are ferroan anorthosites, which are composed dominantly of plagioclase, and represent the oldest highland materials. These ferroan anorthosites, in addition to containing Ca-rich plagioclase, also contain olivine and pyroxene that is more Fe-rich than most of the Mg-rich crustal rocks and are so named. These materials are well represented in the Apollo 15 Genesis rock and the Apollo 16 samples and are thought to have formed as coarse-grained intrusive rocks by flotation of plagioclase in the lunar magma ocean. *Ferroan anorthosite: The mafic minerals in the ferroan anorthosite are relatively enriched in Fe compared to high-Mg anorthosites. The ferroan anorthosites are more abundant Moon-wide. Mg-rich rocks: This second group of rocks is more varied, including some plagioclase-rich rocks, but many rocks with more pyroxene and olivine and correspondingly smaller amounts of plagioclase. Within the Mg-rich group are several rock types distinguished by their major minerals: Gabbros and norites are composed of pyroxene and plagioclase, troctolites contain mostly olivine and plagioclase, and dunites are nearly pure olivine rocks. If a magma ocean did indeed form on the Moon, the Mg-rich rocks probably formed after it had largely solidified. KREEP rocks: In contrast to most other lunar rocks, the KREEP rocks are highly enriched in potassium (K), rare earth elements (REE), and phosphorus (P). The few known pristine KREEP rocks are basaltic lavas. They are apparently older than most of the basaltic lavas that fill mare basins. KREEP rocks appear to be most abundant around the Imbrium Basin. Because of its unique chemical character, KREEP is recognized in many breccia samples (see below); only a small amount is needed to produce a distinctive chemical signature. The predominance of breccias in the Apollo inventory indicates the significant influence of impact processes on lunar regolith materials. A breccia consists of coarser fragments or clasts of rock, mineral, or glass, enclosed or contained in a matrix that is of a finer grain size and may be of either similar or different material. * Breccia: Rock that consists of coarser fragments or clasts of rock, mineral, or glass, enclosed or contained in a matrix that is of a finer grain size and may be of similar or different material. The conversion from soil to rock depends on the degree of lithification. The interpretation of a breccia clearly indicates mixing of different materials by a mechanism that does not separate the materials from one another. The repeated mixing by impact processes is evidenced in lunar breccias. Nothing better demonstrates the intensity of meteoroid bombardment of the lunar surface throughout its history than the fact that most rock samples returned by the Apollo missions are breccias (consolidated fragmental rocks), which were formed during meteoroid impacts. Breccias are complex rocks composed of discrete rock, mineral, or glass fragments (clasts) set in a matrix (the finegrained material between the larger rock and crystal fragments; matrix can be made up of similar fragments that are just smaller, or it may be made of a completely different rock type). The individual clasts may represent a wide range of components of different composition and age, including lunar bedrock, pieces of older breccias, and clots of impact-melted rock (textures of the melt rocks can range from glassy to completely crystalline). Such complex rocks have bred complex classification schemes, but two fundamental types can be distinguished: monomict breccias and polymict breccias. 1. Fragmental breccias: These rocks are composed of fragments of rocks, often including earlier-formed breccias, in most cases just barely stuck together. The matrix consists of finer-grained fragments of the same material. 2. Glassy melt breccias: These breccias consist of a similar variety of fragments (clasts), enclosed in a matrix of impact-melt glass. The glassy matrix has not crystallized, implying rapid cooling of the rocks. As the number of fragments decreases, glassy melt breccias grade into fragment-poor impact glasses, although no dividing line has been established between the two rock types. Crystalline melt breccias: These rocks are similar to the glassy melt breccias, but the melt matrix cooled more slowly. As a result, the originally molten matrix has solidified to form a crystalline igneous rock that often resembles a lava. The ratio of clasts to matrix varies widely. Clast-poor impact melts: Crystalline melt breccias sometimes have so few clasts that they may have textures similar to a lava, and can be referred to as clast-poor impact melts. In many cases it is difficult to distinguish between these melt breccias and pristine lunar igneous rocks. A lot of research and discussion between lunar geologists has been directed, not always successfully, to making distinctions between clast-poor impact melts and lavas. Relatively high concentrations of rare elements thought to be introduced by meteoroid contamination (e.g., Ir, Au, Os; see section 8.6) are often used as a criterion of impact-melt origin. 5. Granulitic (metamorphic) breccias: Granulitic breccias were formed during the alteration and recrystallization of other breccias that have been subjected to high temperatures (~1000°C) since they were formed. Under these conditions the original textures have been obliterated during recrystallization and replaced by an even-grained granulitic texture. A completely recrystallized rock that retains none of its original texture is a granulite. Dimict (two-component) breccias: Two-component breccias may have been produced in the shattered rocks injected by and mixed with impact melt below an impact crater. Similar rocks have formed this way on Earth, where the impact-melt component is called pseudotachylite. 7. Regolith breccias: Breccias that preserve distinctive regolith features, such as small glass spheres and vesicular regolith glasses (agglutinates), are classified as regolith breccias. These breccias are simply regolith that has just barely been turned into a rock. Ferroan anorthosite: These rocks are light colored, rich in Ca and Al, and are composed mostly of plagioclase feldspar. Minor minerals include pyroxene and olivine, which are richer in Fe than those of most Mg-rich crustal rocks (see below); hence the adjective “ferroan” is applied to these anorthosites. These anorthosites may be the pro-ducts of flotation of plagioclase in a magma ocean. Ferroan Anorthosite 60025×20, cross polarized light (Inset ×20, plane polarized light). Field-of-view: 8-mm long dimension Sample 60025 is a lunar highlands anorthosite from the Apollo 16 site. It is a cumulate that formed by floating of plagioclase in the lunar magma ocean during formation of the early lunar crust. Technically, it is a lithified anorthosite breccia or cataclastite, and contains ≈98% plagioclase of composition An95 to An97, and only 2% pyroxene. Fragments of several anorthosite compositions, as determined from the pyroxene compositions, are present. Pyroxenes include augite and orthopyroxene, and olivine is rare. Note the faulted plagioclase crystal (center) and numerous other deformed, faulted, and polygonized grains. All grain sizes exist as evidence of impact processes. Sample 60025 was determined to be 4.44 aeons old by Sm-Nd dating, which is about 110 million years younger than the age of the Moon. Impact Melt Breccia 65015×40, plane polarized light. Field-of-view: 4-mm long dimensionSample 65015 is an impact melt breccia from the Apollo 16 site, which contains clasts of anorthosite, gabbroic anorthosite, and some basaltic material. It is interpreted to have formed from a melt sheet of fallback breccia inside a large lunar crater, which fell into a short-lived lava lake. The trace element chemistry of this sample is similar to KREEP basalts, and significant component of meteoritic materials is present based on the elevated Iridium content. Polymict Breccia 14305×20, plane polarized light. Field-of-view: 8-mm long dimensionSample 14305 is a polymict breccia from the Apollo 14 site, which exhibits rock and crystal fragments set in a dark matrix. The fragments include other breccias, and this polymict rock contains a variety of lithologies, chemistries, and histories. Several impact events are required to produce this mixing of rock types. The large light-colored fragment on the right is shocked anortho-site. The large grain to the left of center is a breccia clast, as is a smaller fragment to its lower left. A mare basalt clast from this sample was found to be of the advanced age of 4.23 aeons, and cosmic ray exposure studies have demonstrated that this sample was tumbled over time. Regolith Breccia 15299×20, plane polarized light. Field-of-view: 8-mm long dimensionSample 15299 is a regolith breccia from the Apollo 15 site, and shows a variety of rocks that include fragments of anorthosite, basalt, orange and green glass spheres and fragments (colorless, hard to distinguish), and monomineralic fragments in a dark brown glass matrix. Dark regions may be relict agglutinates, which distinguish this material as a regolith breccia. This breccia represents the total package of regolith materials that are shown in disaggregated form in the following images.